Mold – Mold is the #1 threat to the indoor environment. All mold is allergenic and some can be toxic. According to the EPA, mycotoxins, produced by mold during metabolic phases and as a defense mechanism, can cause illnesses ranging from an allergic reaction to cancer. Dust Mites – Dust mites are the #1 allergen-producing organism in the home. Dust mites are microscopic spiders that feed off dead skin cells. A standard mattress can contain 1 to 2 million dust mites. Dust mites are not airborne so they cannot be filtered out of the air. Pet Dander – Animal dander is dead skin cells, hair follicles, dried saliva and urine. Most animals produce a protein, glycoprotein, to which many people are allergic. Bioaerosols – Any pollutant in the air which is created by a plant or animal is considered a bioaerosol. Pollen, rag weed, mold and fungi are all bioaerosols. Bacteria and viruses are also within this classification. VOC – Volatile organic compounds are vapors or gases that are carbon based. There are hundreds of volatile organic compounds in indoor and outdoor air, many of which have adverse impacts on human health. Why is Healthy Air Important? According to the American Lung Association more than one-third of Americans have an allergic sensitivity to at least one common substance. They go on to say that asthma rates in the United States have increased 75% over the past twenty years and asthma among children has risen 160%. Although the causes of allergies and asthma are largely unknown, the triggers are easily identified and, with the proper attention, can be controlled. Beyond eliminating specific sources of contamination, acceptable indoor air quality has three key components – ventilation, humidity control and filtration. Energy saving construction techniques may cause contaminants to be trapped in the home and become concentrated. Ventilation is required to dilute these pollutants. According to ASHRAE, the nation’s most recognized authority for ventilation and air conditioning, the air in your home should be exchanged a minimum of 8 times per day. In our climate, however, the humidity brought in with that outside air must also be considered. Dust mites, the most common allergy producing organism found in the home, and mold, the greatest health risk in the home, can be restricted through humidity control. High humidity not only supports dust mites and mold, but can also increase the release of VOC’s from building materials. 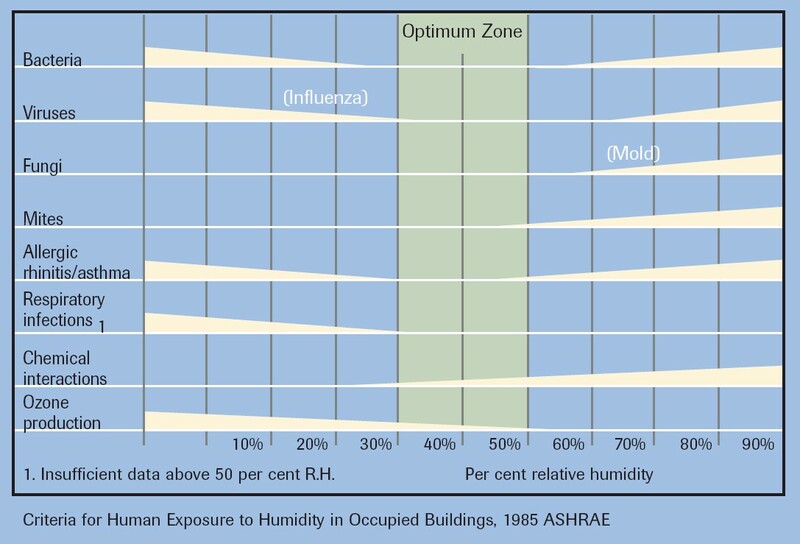 As you can see from the chart below, a humidity level between 40% and 50% is the ideal range to control allergy producing organisms in the home. Major advances have been made in the area of filtration, both media-type and electronic. Combined with humidity control and fresh air ventilation, high efficiency filtration is the third key element to improved indoor air quality. Those with allergies, asthma or other respiratory concerns should be particularly aware of the benefits of high efficiency filtration. Caution should be used, however, when using products such as pleated filters. Readily available and marketed to improve air quality, pleated filters can actually make things worse if the duct system is in poor condition. Since air will take the path of least resistance, more air is pulled in through duct leaks with a pleated filter. If the duct system is located in an unconditioned attic, or worse, a crawl space, "bad" air being pulled into the house can actually increased. If you suffer from asthma or sensitivities to allergens (such as mold) or other irritants, GLS Engineering can help you breathe a little easier. Your doctor will agree that the most effective way to limit your symptoms is to limit your exposure. "Once an allergy has been identified, the next step is to decrease or eliminate exposure to the allergen. This is called environmental control. Evidence shows that allergy and asthma symptoms may improve over time if the recommended environmental control changes are made." Simply put, most homes in the Lowcountry are not capable of maintaining acceptable indoor air quality † . Many have moisture-related problems unique to the region and/or have deficient air conditioning systems; most, however, were simply designed without regard to indoor air quality and do not provide the fresh air ventilation, filtration and humidity control necessary for sensitive occupants. The Environmental Protection Agency (EPA), the American Lung Association and the American Society of Heating Refrigeration and Air-Conditioning Engineers (ASHRAE) agree that proper ventilation, humidity control and air filtration are vital for healthy indoor air. Properly designed and installed systems address each of these important issues. If you are serious about the quality of the air in your home, GLS is here to help. After discussing your individual sensitivities and concerns, we will conduct a diagnostic assessment of your home to determine if there are any site-specific, building or system issues contributing to poor air quality. We will then develop a strategy to address point-source contaminants and improve overall air quality in your home via building envelope improvements, moisture management, proper ventilation, filtration and humidity control. † ASHRAE (The American Society of Heating, Refrigerating, and Air-Conditioning Engineers) defines acceptable indoor air quality as: air toward which a substantial majority of occupants express no dissatisfaction with respect to odor and sensory irritation and in which there are not likely to be contaminants at concentrations that are known to pose a health risk. If you need more information on Healthy Air, then please call GLS Engineering at 843-881-4803 or complete our online request form.